When it comes to Christian dating, if you aren’t looking for a strictly religious pool of daters, there isn’t a better choice than eharmony. The website and its patented personality profiling was founded nearly 20 years ago, with core religious beliefs in mind, and uses a managed approach in matchmaking likeminded singles based on in-depth compatibility, in the hopes of forming long-term relationships. With research finding up to 90 couples a day getting married after meeting on eharmony, it’s a no-brainer for Christian singles looking for love. On the sign up screen, you will be prompted to enter a few pieces of basic information, such as your email address and location. Once this has been completed you are technically a member of eharmony, but you will not be able to access any of the matchmaking functionality until you have completed the in-depth personality quiz they are so famous for. The initial stage of questions do not require much thought, but include various background information such as whether you have children. At this point it becomes more time consuming. The comprehensive quiz is the centre of the scientific process which makes successful matches. This process can take anywhere from half an hour to over an hour to complete, but once it is completed you will never have to spend any more time on receiving matches, so don’t rush! It is important that you are honest and think about your responses. The questions vary from rating yourself on a number of words as to how well they apply to you, to more lengthy descriptive answers in open ended boxes. There are questions which will be intuitive and easy to answer, and others where you might have to dig deep. 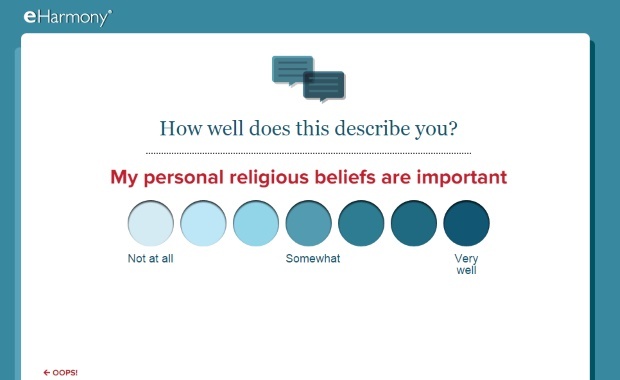 The questionnaire includes a section to describe your ideal match, including religious preferences. Once complete, you will be able to add extra details to your profile and view how you appear to other users when you are sent as a match. In this area, eharmony are miles ahead of the competition. The bespoke profiles are absolutely beautiful and simple to navigate, looking modern and stylish as well as fun and welcoming. Included in the personality quiz are many religiously minded questions to consider, including how important Church involvement, Religious faith, and your Religious community are to you. By marking these down as ‘very important’, you will be better matched to likeminded Christians. 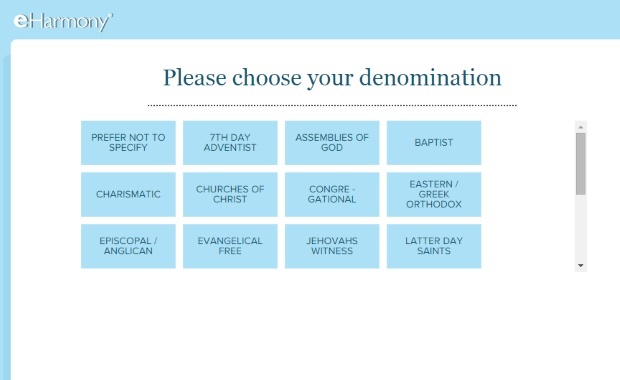 There is also a place to mark down your religion itself, and more specifically, which denomination you consider yourself. At this point, most of the control is taken away from you! Unlike many other mainstream dating websites, where you can browse through hundreds of profiles and chat to whoever you like, which often ends up as a waste of time, eharmony dedicates staff to matching you with likeminded singles who you have the best chance of compatibility with. You receive daily matches via email, which allow you to view specific member profiles and photos, and then you can communicate with those you feel have the best chance of working. Once you have full membership, users can talk on the phone securely, get identity verification through RelyID, and see when matches were last online. Don’t expect to be inundated with matches. Unlike other dating websites, the profile questionnaire is so in depth that anyone suggested to you is likely to be extremely compatible with your core values and expectations in a partner, a much more targeted approach to finding you a suitable partner. An excellent extra you receive with eharmony is the Book of You. This is a guide to your personality and character, and allows you to look at yourself in a much more real way than you probably ever have done before. Many users have said it was worth signing up to eharmony for the Book alone! Especially if you come from a religious background, you want your online dating experience to be as safe as possible, and an easy way to report suspicious or malicious behaviour. While eharmony does not often experience this kind of intent, probably as a result of the in-depth sign up process, they still publish an excellent document on safety advice and tips for protecting yourself from abuse both on and offline. They encourage you to report anything suspicious immediately, and all profiles are vetted before being shown to other users on the site. eharmony’s unbeatable personality profiling is why they remain one of the most often used online dating websites for those looking to make a committed connection. Any single person will find the Book of You both fascinating and helpful to discover what they are looking for in a mate. The intuitive and targeted matching system ensures that you are guaranteed to find likeminded Christian singles near you.